I hope you're all doing well! Today I want to share a unique, Canadian brand that's totally changed my body care routine for the better. Buhbli Organics is a Canadian beauty brand that's striving to revolutionize green beauty. They want to create high quality, organic products for your skin, hair, and body, but at an affordable price. Their products are 100% USDA Certified Organic, Canadian made, vegan, and cruelty free. Buhbli Organics offers all kinds of products for your skin, hair, and bath needs. They also offer essential oils and soap nuts! How can I customize my skincare routine with Buhbli Organics? Facial oils are a key part in any skincare routine. Oils can help you remove your makeup, cleanse, hydrate, and they even act as a serum. They're incredibly nourishing, with so many different benefits for each oil. To customize your skincare routine with Buhbli, I recommend pairing one of their pure, organic oils with an essential oil. To mix your oils, you'll need a one ounce glass bottle. Fill the bottle 3/4 with your carrier oil. Add about five drops of essential oil. Shake the bottle to thoroughly mix the oils, and then you're good to go! This blend is great for all skin types. The argan oil works to seriously hydrate and nourish your skin. It's also great for healing your skin. Acne and acne scars don't stand a chance! The frankincense essential oil pairs really well with the argan oil because it's going to help with wrinkles and signs of aging. It also has anti bacterial, disinfectant properties that are going to work to reduce acne and skin issues. And last but not least it's an anti inflammatory so it's going to help calm your skin. Rosehip oil is a great oil that's beneficial for all kinds of skin types. But it's really great for more mature skin types as it's protective against signs of aging. Lavender is an essential oil powerhouse. It's an anti-inflammatory so it's great for sensitive, irritated skin. Its also detoxifying and anti bacterial so it can help reduce acne. Plus lavender can work as an anti-depressant so it's wonderful if you've been feeling a little down lately. 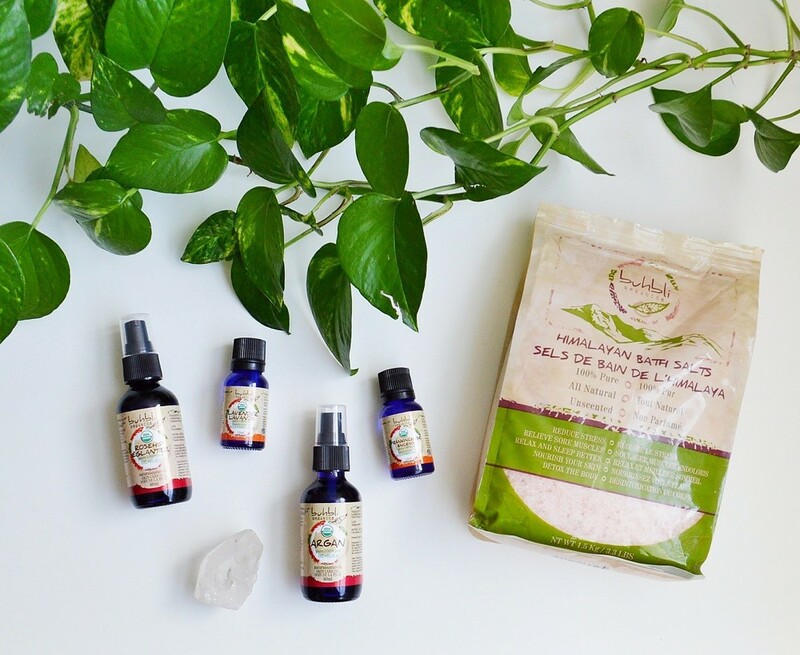 How can I customize my body care routine with Buhbli Organics? One of Buhbli Organic's most popular products is their Himalayan Bath Salts*. 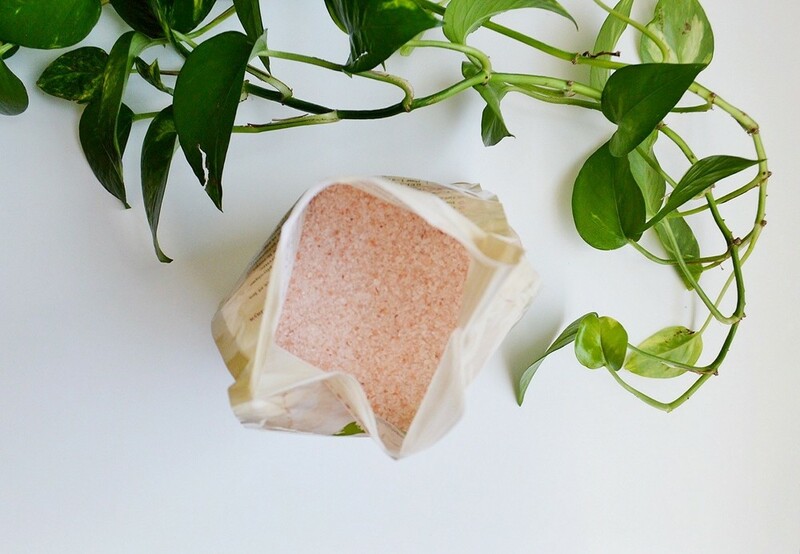 These bath salts are a simple way to naturally infuse your bath with detoxifying minerals. I throw a handful or two in every bath to give my body a much needed boost. To customize your bath routine with these unique salts, I like to mix the Buhbli Organics salts and oils. Combining one cup of Himalayan Bath Salts with ten pumps of Organic Argan Oil and five drops of Organic Lavender Essential Oil work to give your body a detoxifying treat, while also hydrating your skin and providing a relaxing aromatherapy experience. Where can I get Buhbli Organics? As part of their commitment to providing quality skincare at an affordable price, Buhbli Organics is available online and in Walmart Stores across Canada. Their Himalayan Bath Salts are available at every location across the country, while their skin and hair products vary by location. What do you think of this unique brand?